Artist Nilesh Bharti was born in 1984 at Nasik district. He completed his G.D. in Art painting from the Nasik School of Art & a Dip.in Art Ed. from the J.J School of Art, Mumbai. From early days Nilesh was interested in Landscape painting. In Landscape painting he always has been experimental. His works range from Nasik’s famous temples, and slice of life paintings . In his college days at Kalaniketan art school, Nasik we can experience the influence of Landscape painting of Ganga Ghat and places surrounded by it, temples, reflections, common man’s behavior. Medium used by Nilesh is dry pastel and charcoal, used effectively so the impact of the painting is so beautiful. Dry pastel and charcoal medium is used by very few artists but Nilesh has convinced strength and sweetness by skillfully using this medium. Nilesh continued with landscape paintings while studying in Sir J.J school of Art. He has been awarded many National awards amongst which the latest is the 1st prize in Bombay Art society 2010, Best Landscape painting award. He has done exhibitions at Nehru Center Art Gallery, Bajaj Art Gallery, Jehangir Art Gallery Mumbai. His collections of paintings are praised in India and abroad. Now he works in Nasik. Chitari Art Academy Pune 2006 1st Awards for Landscape. All India National Students painting Competition Varnika–Gold Madel-Ujjain-2005. Gallery Chose student of the year award- pradarshak Art gallery- Khar-2008. 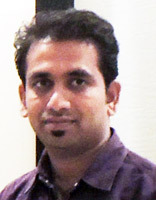 Artist Nilesh Bharti was born in 1984 at Nasik district. He completed his G.D. in Art painting from the Nasik School of Art & a Dip.in Art Ed. from the J.J School of Art, Mumbai.